Do you take advantage of Prime Day deals? I usually don't as I feel I would end up buying things that I really don't need but want, know what I mean?! LOL! But this year I knew that I wanted an air fryer. My kids are kids and they still love breaded chicken in any form. While I have created healthier ways to make them they are still cooked in oil (a lot of oil) and so time-consuming to make! Plus I do enjoy a chicken cutlet here and there! So I was on the hunt for an air fryer and I ended up with this one - Super Deal XXL Air Fryer! Mainly because it was one of the cheaper ones - I got it for $50! I mean an air fryer is an air fryer, right?! 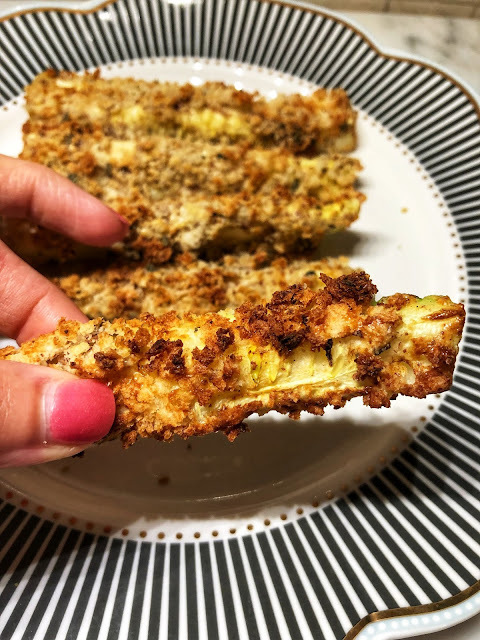 The first food that I 'air fried' were zucchini fries and they were delish! So crispy and love the non-oily taste too! Just look at that crispiness! Then I tried chicken tenders that I made with almond meal and those came out so crispy too! This thing amazes me I tell ya! Everything comes out crispy with no oil!! Plus, everything cooked within 15 minutes! Score! Up next then, Eggplant cutlets! For this recipe, all you need is 1 medium eggplant sliced into 1 in rounds, good sauce, breadcrumbs of choice (you can go GF, almond meal or I ended up blending a few slices of Dave's Killer Bread that I had), fresh mozzarella (you will thank me for this), beefsteak tomato, balsamic glaze and fresh basil & parsley. That's really it! The most labor-intensive part is prepping the eggplant which consists of slicing the eggplant, laying them out and sprinkle with salt (to get the bitterness out), then breading them. Other than that they cook up super fast in the air fryer and then you just put together the stacks. I start with sauce at the bottom of the pan, then I layer one slice of eggplant, tomato, mozzarella, a spoonful of sauce, and a piece of fresh basil and then top with another eggplant slice and spoon sauce on the top again. Just repeat until all slices are used up. Then I drizzled the glaze evenly over the top and sprinkled with fresh parsley and basil. Feel free to grate fresh parm cheese over the top or nutritional yeast (a dairy free option - but if you already have the mozzarella in there then....) Bake for about 15 minutes until everything is heated through and the cheese is melted. That's it! If you don't have an air fryer then you can bake the slices before stacking them - they just may not come out as crispy but it will still work! These are great for leftovers too! I paired mine with zucchini noodles but you can pair these with anything! Salad, veggies, pasta..... for a complete meal! Don't forget to tag me on Instagram or connect with me in my private FB group My Fit Life Tribe to show me your air fryer meal! Would love to hear what you make in your air fryer!! 1. Place eggplant rounds on a lined baking sheet. Sprinkle salt on one side and let 'sweat' for a few minutes (once you see water forming dab it away with a paper towel) Repeat other side. 2. Whisk the eggs in one bowl and place the breadcrumbs in another. Make a workstation to dip the eggplant in the egg wash first, drip off any excess, then coat in breadcrumbs. Place coated eggplant slices on another baking sheet or towel. 3. Turn on the air fryer and place eggplant slices in batches to cook. Mine took 10 minutes each. 4. While these are air frying preheat oven to 375f. 5. Coat bottom of a large rimmed baking dish with 1 cup of sauce. Start to layer first layer of air fried eggplant slices. 6. 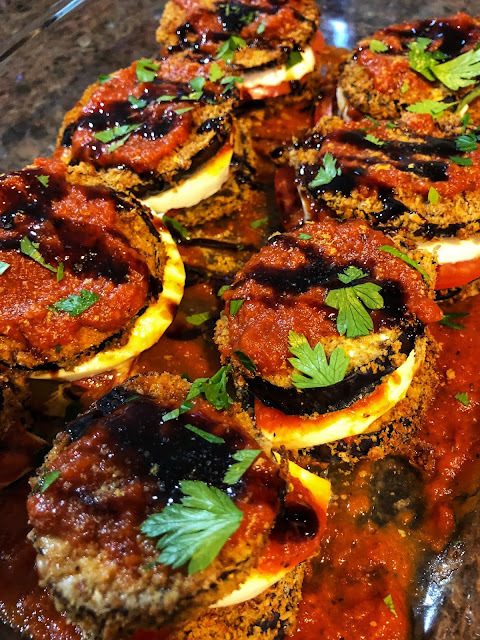 Top each with a tomato slice, mozzarella slice, a spoonful of sauce, basil leave, then top with other air fried eggplant half (make sure to keep the sizes similar). Add another spoonful of sauce on top of each stack. Drizzle all of the stacks with the glaze and sprinkle with fresh parsley & basil. 7. Put in oven for 15-20 minutes to warm through and the cheese melted.